Specialized in inspecting houses and condominiums built before 1947. « Home Inspection Testimonial Email from R.M. I attended the radon presentation at the Architectural Heritage Center this past weekend- what a great event! AHC always puts on great educational programs and this one provided some fun radon facts. If you don’t already know about radon, it’s an odorless, colorless, tasteless radioactive gas that occurs naturally in our soil and water. Buildings trap escaping radon, forcing us to breathe it unknowingly. Radon is the #2 cause of lung cancer among non-smokers. Levels of radon are different for every home. If you don’t know what the radon levels are in your home, get a home testing kit or call me and I will test for you! 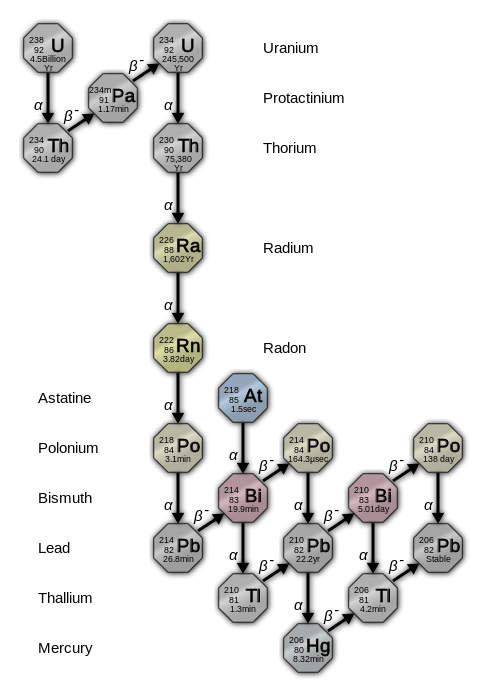 The chemical element radon comes from uranium & thorium, which decays into radium and then into radon. 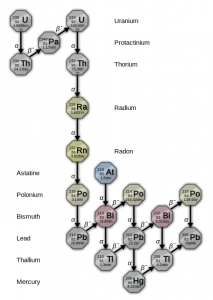 Uranium and thorium are the two most common radioactive elements here on earth. 20% of U.S. deaths are due to radon-related lung cancer. Your risk is 5x greater if you are a smoker. Radon was a food additive in the early 1900s! There were also radon caverns where you could go to breathe in radon… yikes! Newer homes are more tightly sealed (for energy conservation) and are potentially keeping more radon in homes. Granite countertops emit very low levels of radon. Lower levels of radon are best, obviously… though it’s quite impossible to completely get rid of radon. Outdoor air is approximately .4 pCi/l (that’s picocuries per liter in case you were wondering). The average U.S. home is about 1.3 pCi/l, but this varies from house to house! Your neighbor might have very high levels and yours may be low or vice versa. The Surgeon General recommends radon reduction for homes that measure 4 pCi/l or more and you should consider radon reduction for levels between 2 and 4 pCi/l. 1 in 8 homes nationally tests high in radon. 1 in 15 homes in Oregon tests high in radon. 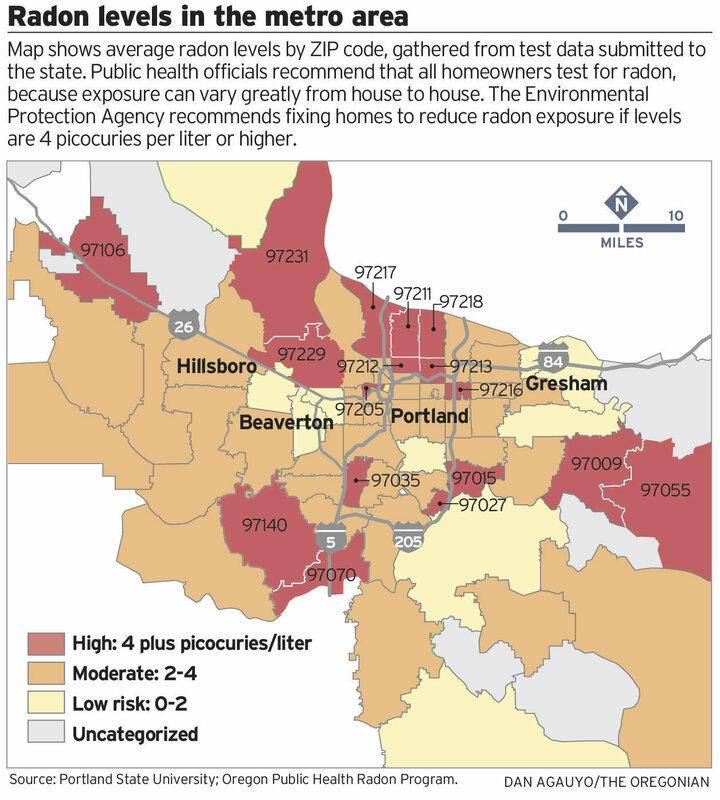 1 in 4 Portland homes tests high in radon. Areas that have highly permeable soils and/or have had landslides generally have higher radon levels. Alameda ridge, north Portland, east Portland, Sherwood/Newberg, Lakeview and Clark Co. (Washington) have a higher risk for high levels of radon due to the geology of those areas. An example of the seasonal effects of radon can be higher levels when it rains- the water seeping into the ground pushes radon up out of the soil. HEPA air filters are NOT effective in reducing radon levels in your home. Radon testing can be long-term (3-12+ months) or short-term (2-4 days). If you have a long-term radon monitor plugged in in your home, remember- the equipment needs to be re-calibrated annually! There are several ways (both passive and active) to reduce the radon levels in your home. Talk to a professional about the most effective system for your situation. If you are constructing a new home, install a passive system! It is best to test for radon in the winter months while windows and doors remain mostly closed. Still want to know more? Check out the EPA website or the Portland, Oregon radon website. And watch this Oregon Field Guid Radon video. This entry was posted on Tuesday, November 11th, 2014 at 9:05 am	and is filed under News. You can follow any responses to this entry through the RSS 2.0 feed. Both comments and pings are currently closed. Almost all basements leak! Simple things can be done to your home to prevent water intrusion into basements.